WACO, Texas (AP) — Royce O’Neale scored 16 points and had 12 rebounds as Baylor beat Texas Tech 59-49 Saturday even as the Bears went the final 8 minutes without making a field goal. The Bears (19-10, 7-9 Big 12) led 50-36 after Taurean Prince completed a three-point play with 8:05 left in the game. They didn’t make another field goal, but Kenny Chery hit seven consecutive free throws in the final 3 minutes before a miss. Brady Heslip added 14 points for Baylor, which got a needed victory for its NCAA tournament hopes. 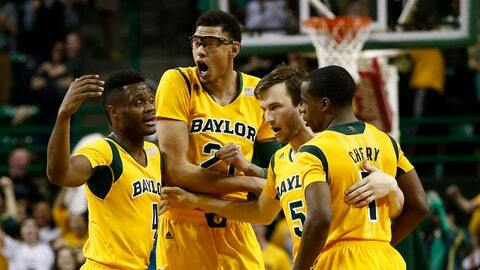 Robert Turner had 12 points for Texas Tech (13-16, 5-11), which had beaten Baylor at home by 10 points. Toddrick Gotcher and Aaron Ross each had 10 points. Baylor shot just 30 percent overall (16 of 53). The Bears had a 40-24 rebounding margin, and in an unusual twist they had more offensive boards than defensive ones (21-19). The Red Raiders have lost five in a row since a three-game winning streak. Heslip and O’Neale had consecutive 3s that put Baylor up 43-27 less than 4 minutes after halftime. Texas Tech went nearly 5 minutes without a basket midway through the half. Even with Baylor’s miserable shooting, the Red Raider never got closer than five points after halftime. They did that twice, on a reverse layup by Ross and then his short jumper after the first of Chery’s closing stretch of free throws. Texas Tech’s only lead came on Dejan Kravic’s tip-in for a 2-0 lead 72 seconds into the game. Heslip hit a 3-pointer on Baylor’s next possession. The game was tied twice, the last at 12-all before an 8-0 run by Baylor midway through the first half that was capped by Cory Jefferson’s 3-pointer. The Bears scored the last seven points before halftime for a 33-22 lead, when Kravic had already scored all of his eight points.